Melissa Perry Moraja, CEO of Melissa Productions is excited to announce her fourth book in the Wunderkind Family children’s book series titled ‘The Tale of the Messed Up Talent Show’ to be self-published in November, 2013. The Wunderkind Family children's books is an extraordinary gifted family trying to live an ordinary life. Melissa Productions announces today that the fourth book in Melissa Perry Moraja’s Wunderkind Family children’s chapter book series will be available for sale during November, 2013, just in time for the holidays. The Wunderkind Family is an extraordinary gifted family of six with each book in the series told by one of the four Wunderkind siblings. This series teaches children that each child has special talents within their family, making each and every one of them extraordinary in their own way. In ‘The Tale of the Messed up Talent Show,’ Madison gets a taste for what it’s like to be popular. 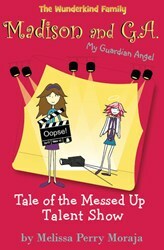 What Madison soon discovers, with the help of her guardian angel, is that being popular isn’t all it’s cut out to be. And as if things couldn’t get any worse, everything that could go wrong at the annual talent show did; and of course, not without a little help from her klutzy and curious guardian angel, making this story, which is full of humor and adventure, a must-read. Promotions leading up to the release of ‘The Tale of the Messed up Talent Show’ will be announced on Melissa Productions website, http://www.melissaproductions.com and the company’s social media sites, Twitter and Facebook. Melissa Perry Moraja stated that she also will be sharing illustrations and pages from her new book on her blog and Facebook page. Melissa Perry Moraja is an entrepreneurial mom, a multifaceted business woman and a creative producer, authoring and illustrating numerous children’s stories and self-help books. Founded in 2009, Melissa Production’s mission is to offer humorous, inspirational products and services that promote self-awareness, creative learning, and leadership with the family in mind.With popular story book characters like Splatter, she speaks to children’s hearts through humor and parents thoughts by providing educational stories. For more information, please visit http://www.melissaproductions.com. Founder and CEO, Melissa Productions, Inc.